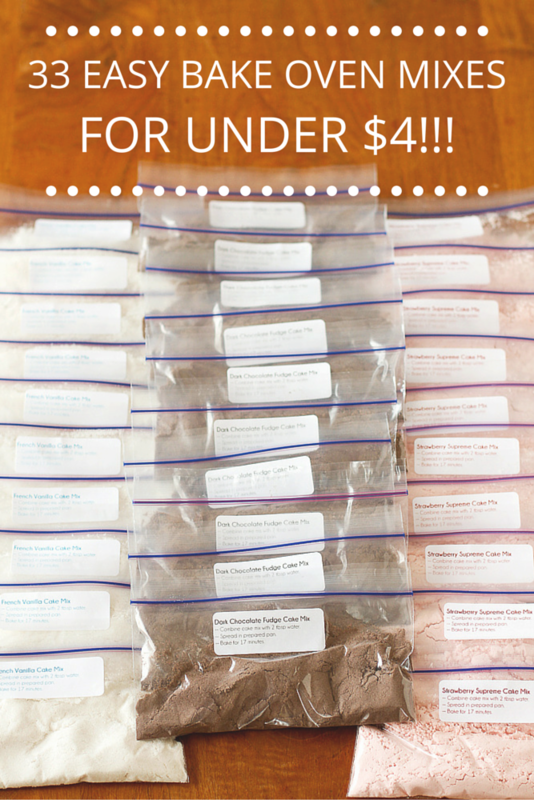 Tara from Unsophisticook shows you how to make 33 Easy Bake Oven Mixes for under $4! Confession time: I always wanted one of these ovens growing up! Anyone else? « Shutterfly: Free 8×8 Photo Book — just pay shipping! I came to your blog looking for another post I saw on Twitter on my phone, and found this one and just wanted to say THANKS! I always wanted and Easy Bake oven growing up but my parents had other kids to worry about so I never got one. I bought one for myself about 8 years ago and never even opened the box. My daughter is 2.5 now and she discovered it in the closet. We opened it and had to throw away the mixes. They are so crazy expensive! I made a batch of cookies in the regular oven but we put a few in there so she could play with it. Now we’ll be able to make stuff for her to share with her daddy. One thing that I really, really wanted when I was little was those Jellies (shoes — see a picture of what mine looked like here: https://dailyhodgepodge.files.wordpress.com/2012/07/jelly-shoes.jpg — yes, I remember!). Anyone remember those? Anyway, my parents finally got me some and then we went to a waterpark and I forgot to take them off when I went down the water slide and they were lost forever in that huge gushing pool at the bottom. It was heart-breaking! Great post! They can easily be converted if your little person is gluten free too! Oooh! I have no use for this recipe as I’ve got a boy, a big boy of nearly 12, who bakes in my gas oven. But I had an Easy-Bake Oven when I was a little girl and I loved it to pieces. It was so much fun. But even back, then, in the early to mid 70’s, the mixes were really expensive. I had a pair of Jellies too. Oh how I loved them. Thanks for the flashback. Also I love the *Friends* quote from Monica about how unreasonable it is to make a kid wait for a light bulb to cook brownies! I always wanted an easy bake oven growing up too. I remember mom said she was afraid of fires…. Thanks. My daughter received one a year ago for Christmas. We will have to try this. We are all out of mixes in our house and I was happy to discover you can make your own! In looking at the Duncan Hines Signature mixes you recommend – they typically require oil and eggs. How do these work without those?